Our trial bundle printing service combines electronic and hard copy data to provide you with a fully integrated and reputable service. Ascertaining a complete and accurate set of instructions from the client. Ensuring each trial bundle is 100% quality checked, and hand-turned page by page. Trial Bundle Printing to Meet Your Exact Needs. Offering a flexible and inclusive grading system, our trial bundle printing services balance a high-quality service that’s within your budget. 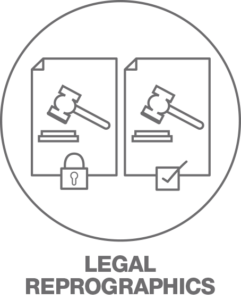 Offering assistance at all stages of the litigation process, our experts are able to reliably produce multiple copies, and our extremely rigorous, hand-turned quality checking process ensures that each trial bundle is identical, of exceptional quality and is fit for presentation in court. Our professionals are skilled in adapting each trial bundle to meet your requirements, offering variables such as conversion to double sided print, A5 configuration and digital adaptation. If required, we are also capable of adhering to court mandated page restrictions to ensure every trial bundle we produce, including Supreme Court bundles, are consistently accurate and of impeccable quality. With a strict focus on quality and client relations, our trained experts work closely with each customer to ascertain a full set of instructions for the trial bundle printing, straight from the offset. For larger trial bundle printing projects, we utilise the services of an experienced paralegal to oversee the process. The paralegal may work with the legal team to understand the requirements, and ensure these are communicated to the reprographics team. This works well because the paralegal is aware of both the bundling process, as well as the reprographics work. Once production is underway, our paralegal will monitor the progress and perform spot check quality control e.g. to ensure bundles are not overfilled and checking documents back against the indices. If time permits, we would prefer to produce a single master set which is sent to you in order for your review. If you are not based locally, we would produce two identical masters to allow remote comparison. We would request you perform a review to ensure you are happy with the output, and we can rectify any issues so that the complete sets are produced correctly. If the documents exist electronically, we perform a lot of sorting and renaming in order to reduce the manual effort for our reprographics team. This is overseen by an eDisclosure consultant who is experienced dealing with electronic documents. We have automation techniques for pagination, which reduces the room for error. Outputs from this process include accurate page counts, which can be used to quality control the hard copy output. Where digital bundles can be submitted and reviewed in court, Anexsys can also provide a proprietary e-Bible solution that can be shared and distributed at a fraction of the cost of hard copy bundles. If you would like to find out more about our trial bundle printing service, then please do not hesitate to contact one of our trained professionals.